Violence against babies and young children in England and Wales more than doubled last year, a survey of accident and emergency unit data suggests. The Cardiff University study indicates the number of under-10s who were hurt rose to 8,067 from 3,805 in 2006. But it found violence against people of all ages fell by 12% overall, following a trend of the past eight years. Researchers said the rise in injuries could be down to domestic incidents or violence between children. BBC home affairs correspondent Danny Shaw said the data showing an increase might turn out to be a one-off for last year. But he added that children's' charity the NSPCC had described the survey's findings as "deeply worrying", and said hospitals and other agencies must work better to identify children at risk. The NSPCC's head of child protection awareness, Chris Cloke, said it was working closely with doctors and nurses to advise them on spotting deliberate injuries. Cardiff University's Violence and Research Group have been monitoring admissions for violence-related injuries in a representative sample of casualty units since the 1990s. Its research into 29 hospital A&E units are extrapolated to national levels. For the past eight years, the overall number of people needing treatment has been falling. In 2007, victims aged over 18 saw the greatest fall in violence, and among over 50s there was a 17% decline. Those aged 18 to 30 remained at greatest risk, making up nearly half of violence-related patients. It is the figures for children aged from birth to under 10 that have caused the greatest concern. The report said: "It is not clear whether violence at the hands of parents or carers is responsible for this increase. "Recent evidence suggests that violence between children at school and in public places is also a problem. "In any event, the roles of child safeguarding agencies including the NHS, police and local authorities remain essential and should be enhanced." Maxillofacial surgeon Professor Jon Shepherd, who chairs the Cardiff group, said: "We would have expected levels among 11 to 17-year-old children to show a rise, because of the increases in youth violence that people have in the back of their minds. "But that was not what we found." The figures were released on the same day the government's latest quarterly crime figures for England and Wales are due to be published. 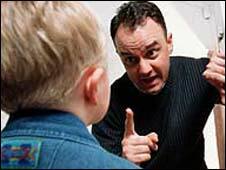 A Home Office spokesman said: "Any violent crime is intolerable particularly when it is directed against children. "That is why the government's recently published Tackling Violence Action Plan includes new resources for healthcare providers, local authorities and the police to share information to ensure that people at risk are protected and offenders are brought swiftly to justice." He noted the report found violence had fallen last year and the British Crime Survey showed incidents had decreased by 31% over the past 10 years. Shadow home secretary David Davis said: "This is yet more evidence showing that violence is becoming an everyday part of life for younger and younger people under this government."